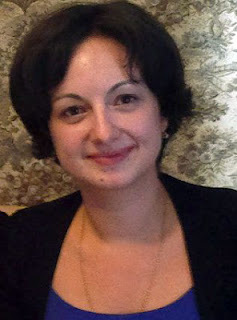 Suzanna Fatyan, one of Uzbekistan's finest tour guides, explores the musical traditions of her hometown, Samarkand, in the lead up to the summer Sharq Taronalari world music festival 25 - 30 August 2013. Uzbekistan’s turquoise domes, mosques and minarets are known to passionate travellers from history books, fairy tales and their own concept of the Orient. Uzbekistan is also known for its people. They make Uzbekistan so special: warm and welcoming. Although the country is rapidly changing it has maintained its authenticity. People proudly follow their traditions, preserve local crafts, and their traditional lifestyle. As in centuries past, early in the morning you can buy non (round shape bread) baked in a tandyr at your neighbourhood bakery. You can go to the old city bazaar and get ceramics for your home from your friendly local trader and buy a sunduk (chest) to store your most beautiful things. Objects and customs that are disappearing worldwide are alive here. Gathering for feasts, weddings or other events, people not only follow traditions inherited from their ancestors, they also listen and perform their traditional music. This music unites people and generations. The best place where you may touch that uniting feature of music is the Registan Square. In the Sher Dor madrassah, in a small hujra (cell) you can meet an amazing musician, Babur, named after the founder of the Moghul dynasty in India, who was Amir Timur's descendant. Babur was born into a family where music and history were highly appreciated. Already at the age of four, Babur started taking his first music classes. 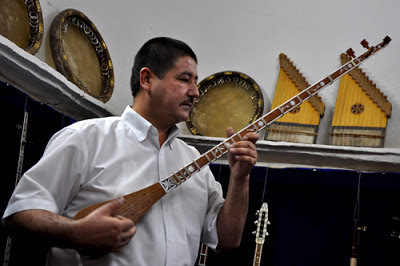 Today, as a professional musician, Babur plays most traditional Uzbek instruments. His room at the Registan Square is a treasury where you discover doira – traditional tambourine, gijak – local violin, dutar - string instrument, chang - variation of psaltery, karnai – a very important wedding instrument - and many more. Presenting beautiful melodies, Babur explains the structure of the instruments, which makes you realise the scope of the ancient trade routes – India, China, Iran, Italy… suddenly you understand the importance of traditional heritage, succession, and mutual influence among people and continents. Among the numerous instruments Babur shows you is something very small and unusual – named lab chang or chang kovuz. You may know it as a Jew’s harp. When you hear its sound you imagine shaman calling for rain near the ritual fire, you visualise the steppes and heavenly horses, you feel eternity! Although lab chang does not seem complicated, it is hard to understand the way the instrument is played. For an inquisitive and musically addicted traveller, Babur may reveal this secret by holding a small chang kovuz master class. You are very fortunate if you are travelling in Uzbekistan during summer. Every two years, at the end of August, Samarkand hosts a spectacular event – the world music festival Sharq Taronalari (Melodies of Orient). Musicians from more than 50 countries participate across five stages in Samarkand, the most spectacular of which is in the Registan Square. It is a splendid, once-in-a-lifetime experience to attend this festival. Music is at the soul of Uzbekistan! Outstanding scholars such as Avicenna, who wrote the Canon of Medical Science, Al-Khorezmi, known for his algebra, Mirzo Ulughbek, ruler and astronomer renown for the Star Tables, Alisher Navoi, author of Khamsa and considered the founder of Uzbek literature – these men were also respected as musicians and even composers. They left us discourses on musical theory and summaries of music inherited from our ancestors. The musical passion of our ancestors is also displayed in fine arts. 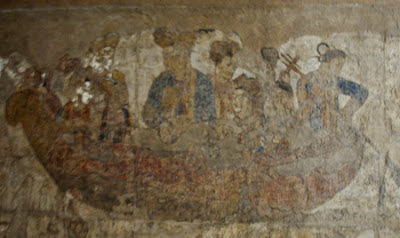 The famous murals of Afrosiab include an image of a Chinese princess surrounded with musicians. Miniatures by artists such as Bekhzad, Sultan Muhammad, and Mirza Ali provide us with knowledge of the history and evolution of musical instruments. Regardless of whether we refer to epic genre, architecture, poetry, fine arts, fairy tales of Arabian nights or rituals, we face the music! 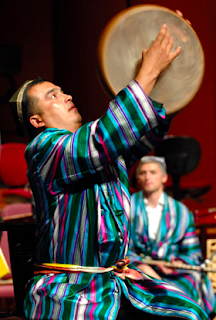 Thus, Samarkand continues to be a musical melting pot, inviting people of different cultures and countries to share their melodies and learn about Central Asian musical traditions. On an Uzbek Journeys tour you will visit Babur's hujra to enjoy a small concert during which he plays and explains a variety of Uzbek instruments. Babur also sells his CDs so you can bring back a lasting memory of Uzbek music. (The flute CD Melodies of Nay is glorious).